Spinneybeck is pleased to introduce a redesigned website and rebranding. The new website works effortlessly on any device, from your desktop to your phone to your tablet. And we’ve added new content about leather, a more robust Color Book, added product information and imagery plus a portfolio which showcases our diverse project work. 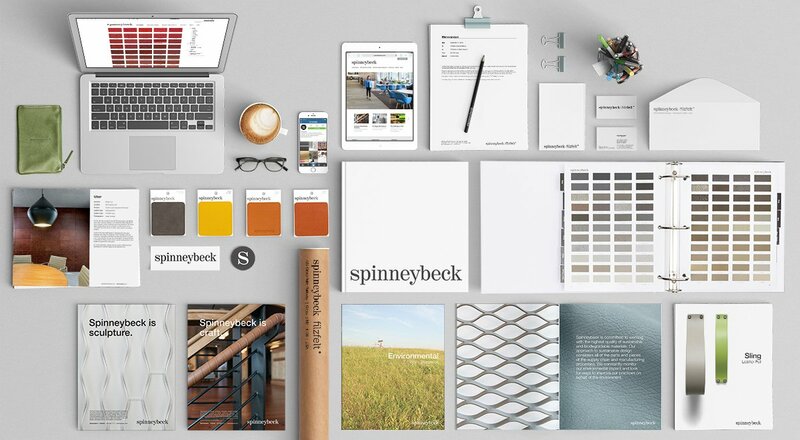 Sampling and collateral materials have also been redesigned to highlight the high quality and extensive color range of Spinneybeck’s full grain leathers while continuing to innovate through our expanding collection of architectural products and custom capabilities. The rebranding effort was completed in-house by the Spinneybeck | FilzFelt creative and marketing team, headed by Traci Roloff and Kelly Smith, founders of FilzFelt—the German wool felt startup acquired by Knoll and Spinneybeck in 2011. Roloff, Vice President of Marketing + Communications, and Smith, Vice President of Design, expanded their roles in 2014 to work with Spinneybeck as well. The redesigned Spinneybeck logo creates a fresh look for the company while honoring its five-decade long history. Smith commented, “The simplified graphics allow the material itself, of highest quality and in an incredible range of colors, to shine.” She continued, “We are excited about upcoming collaborations with designers of varying disciplines to continue to innovate and broaden the applications of natural and ancient materials.” Smith revealed that a leather collaboration with Architecture Research Office (ARO) previewed at NeoCon 2015 in Chicago and will be announced later this year.